The man known as former President Lee Myung-bak’s “butler” reportedly told prosecutors that he received the state spy agency’s funds under Lee’s orders, recanting his earlier denial of the allegations. Kim Paik-joon was arrested last week on charges of receiving more than 400 million won ($370,000) from the National Intelligence Service in 2008 and 2010 while serving as the senior secretary for administrative affairs to then-President Lee. Prosecutors reportedly obtained Kim’s testimony that he received the NIS’ off-the-books “special activities” funds under Lee’s orders and that Lee gave instructions on how to dispense it. Kim claims that he never used the money personally. He earlier denied all charges. However, former NIS chief Won Sei-hoon testified that Kim demanded the NIS provide its “special activities” funds as the presidential office lacked the money to cover souvenir costs. Kim Joo-seong, a former senior NIS official who allegedly arranged the delivery of funds to Kim Paik-joon, told investigators earlier that he raised concerns about Cheong Wa Dae’s request for NIS money in a one-on-one meeting with Lee in 2008, but the requests for money continued after the meeting. Lee and Kim Paik-joon have known each other for over 40 years since Kim joined Hyundai Group in 1976. Lee was president of Hyundai Engineering & Construction at the time. Kim has closely assisted Lee in his financial dealings since the late 1990s. Meanwhile, prosecutors interrogated a nephew of Lee on Wednesday over his suspected role in amassing a slush fund at DAS, an auto parts maker run by his family. Prosecutors suspect that Lee Dong-hyung, vice president of DAS, took part in creating and running a 12 billion-won secret fund for his uncle. The son of Lee Sang-eun, the eldest brother of the former president, is the largest shareholder of IM, a partner firm of DAS, which the prosecution raided last week. The questioning on Wednesday took place as part of a widening probe into the former president and his family over alleged corruption and irregularities. 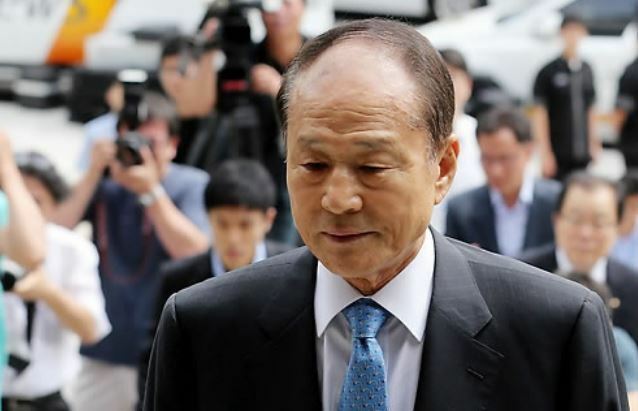 Prosecutors have also summoned Lee Sang-deuk, a veteran politician and the ex-president’s second eldest brother, for questioning over allegations that he accepted illicit funds from the NIS in 2011. Lee, 83, was initially summoned to appear Wednesday, but he asked the prosecution to reschedule the date, citing health reasons. Prosecutors ordered him to appear Friday.